SURFING: TAK TAK TAK BOOM. Tak tak tak BOOM . . .” No, it's not a revival of Jazzy Jeff and the Fresh Prince – it is a surf lesson, and as instructors Sebastian and Marcel call out this mantra over and over and over, I find myself rising to my feet, standing on my surfboard and riding a wave to the shore. We've come to Portugal's southern Algarve coast to learn how to surf. Years of failed attempts, swallowing gallons of sea water, smashing my nose and being thrown off surfboards tell me I'm destined never to make it to shore upright – but who could say no to some winter sun? Surfing has exploded as a sport in Ireland and the attraction is obvious: it is exhilarating, the rewards enormous, the challenges endless. The tiniest improvement feels like a huge achievement. 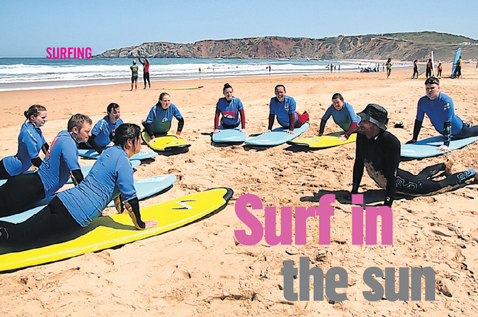 Thousands of hardy souls follow the waves around the Irish coastline, but for rookies sacrificing themselves to the sea, the warmth of the Algarve makes it the perfect place to learn. Our base for this holiday is Lagos, a pretty Roman port town an hour's drive from Faro airport. Daily direct flights from Ireland make it accessible throughout the year, and with temperatures above 20 degrees for eight months of the year, it's a welcome break from the cold Irish winter - and cold Irish summer. Praia Dona Ana, the sheltered white beach in the town or Meia Praia, the long golden stretch on the outskirts of Lagos, are perfect for swimming and sunbathing, but it's the remote beaches of the west coast that offer the best surf all year round. On our first morning, we're collected from our hotel – the sleek, tranquil Hotel Vile GalÃ© on the outskirts of town. We pile into a minibus, stopping to collect the rest of our group before hitting the coast. With a number of beaches within a 45-minute drive, conditions determine where we'll spend the day. Our instructor Marcel opts for Praia del Amoreira as we're a mixed group, ranging from experienced to intermediate surfers to, well, GrÃ¡inne and me. Surfing can seem intimidating, but here, all levels of surfers share the same beaches, with beginners staying closer to the shore, while the braver head out to the large waves. There's a friendly, welcoming atmosphere, which puts us at ease. Eager as we are to fling ourselves into the sea, the basics are best learned on land. We squeeze into our wetsuits, lie on our boards and follow Marcel's lead as the “tak tak tak” mantra begins, each call signifying a change in position until we're upright. When we're surfing the sand like pros, it's time to enter the water. It's not as easy as it was on the beach – funny that – but we're encouraged to concentrate, take it slowly and follow the steps we have learned. It seems ridiculous that you can carry out each movement while a wave rumbles beneath you, but gradually, we begin to get a feel for it. We're falling off less frequently, we're making it to our knees, we can feel success just around the corner . . . what? We have to come in for lunch? Now? Tired arms and legs will cause you to make mistakes, and it's only when we sit down to eat our packed lunch on the beach that we realise how worn out we are. We relax for an hour, chatting to the other surfers, a groups of friends from Ireland. There are also some families dotted around the beach; this is the sort of trip that suits both and can be tailored to your budget and needs: we're staying in a family-friendly hotel on the beach in Lagos while the Irish guys have opted for a lodge in town. Back in the water, we're standing more and more and Sebastian even begins to teach us how to turn and control the direction of our boards; we certainly didn't expect to make it this far. Before we know it, it's 4pm and time to head back into town. Winding our way back to Lagos through a stunning Parque Natural, the minibus is filled with chatter about the day's triumphs and wipeouts – and the snores of a few who are simply wiped out. Most evenings we need a nap as soon as we get back, then it's out to one of the excellent restaurants in Lagos. From simple seafood cafes, serving buckets of fresh prawns drenched in Portuguese peri peri sauce, to the bustling family-run restaurants offering local specialities such as bife Ã Portuguesa (steak cooked in a Port sauce) and Cataplana (a seafood and chorizo dish), the food is delicious and great value. If you can find the energy or fancy a day off, there's more to do besides surfing. Explore the Lagos marina and the cobblestoned old town on foot. Fit in a day's golfing on one of the Algarve's many courses. Try your hand at kite-surfing, quad biking, skydiving, wakeboarding, rock climbing, off-road driving, mountain biking. Or shop at the malls in Faro and nearby Albufeira, or the monthly markets all along the coast. As night falls, the bars and clubs in Lagos come to life, but for GrÃ¡inne and me, an early start and the next day's surf beckon and we fall asleep to the sound of the waves outside our window and “tak tak tak” in our heads. Irish company Surfholidays.comoffers five days of surf lessons (two sessions per day) including daily transfers to beach, equipment and lunch for €200pp. Lessons for adults and children from age of six. Tel: 01-4822828 or visit the surfholidays.comstand at the Holiday World Show in the RDS today and tomorrow. A lodge-style surf house 10 minutes from the town and beach. Incredibly friendly, perfect for groups. Prices from €287pp for seven nights' BB with five days surfing and lunch on beach. Upmarket : Hotel Vile GalÃ©, Estrada da Meia Praia. Value : Paraiso do Mar, Praia Da Amoreira, Aljezur. Tel: 00-351-282991088. Nestled on a cliff overlooking the surf beach of Amoreira, this cafe offers simple lunches. Burgers, omelettes from €7. Midmarket : Adega Da Marina, 35 Avenida dos Descobrimentos, Lagos. Tel: 00-351-282764284. Cavernous seafood restaurant overlooking the marina. Very busy in high season. Amazing prawns and local vinho verde (green wine). Mains from €8. Upmarket : Don SebastiÃ£o, Rua 25 de Abril, Lagos. Tel: 00-351-282780480 . Traditional Portuguese tavern-style restaurant on pedestrianised street in the old town. Focus on seafood and Portuguese meat specialities. Fantastic service. Mains from €16. At night, the cobbled streets of the old town come to life with bars and clubs. Bar Mullen, on Rua CÃ¢ndido dos Reis is a favourite with many visitors, as are Three Monkeys on Rua LanÃ§arote de Freitas and the numerous pubs along Rua 25 de Abril. Escape the bustle of town at Bahia Beach Bar on Meia Praia Beach. Aer Lingus flies from Dublin to Faro year round and from Cork and Belfast from March 25th. See aerlingus.com.